a real autograph on mine! I was a staff member at Sports Collectors Digest. One staff member had attended a hobby show event in Hawaii. He was muttering about a question from former outfielder Al Zarilla. He asked the hobby insiders how much more the card would be worth once he autographed it. To the SCD staffer, he imagined only the lessened value. This pundit told Zarilla HIS truth, that the card would be worth less. I never knew if Zarilla believed it. Sure, “mint” is a subjective term. Was the card untouched or unaltered by human hands through the years? To Zarilla, the autograph was a gift. Like the prize at the bottom of the cereal box. Only 1990s collectors who reached the retiree by mail in Hawaii had a chance at his signature. A company could make tons of cards. 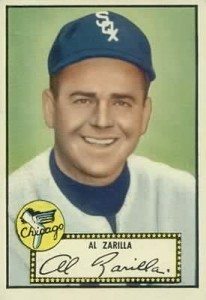 Only one man could sign “Al Zarilla” and mean it. Like an artist and artwork, the autograph was something he had created for someone. He saw true value in that. I second that emotion, Al. With collectors of vintage cards, they need to have cards in the best possible condition (that they can afford, anyway). To them, an autograph on a vintage (or rare) card is not a good thing. Collectors of autographed cards, on the other hand, such as I, usually don’t care how valuable/great/amazing the card is by itself…if we can get it signed, we’ll jump at the chance. A lot of us have no use for a card unless it’s signed. I used to promote card shows in Hawaii and Al Zarilla was a frequent guest. He would always take the time to talk to everyone who purchased his autograph and to thank them. He loved talking baseball. While it’s true that his signing a card might devalue it on the secondary market, anyone who had Zeke sign a card for him in person in Hawaii would tell you that the card (and the experience) were priceless. Agreed, and agreed, to both comments! An autograph should be an experience, not just a product. Interacting with a current or former player makes the signature even sweeter!